#IllGoWithYou is a project by the queer and ally community. Our project arose in response to anti-transgender legislation and therefore, our focus is on offering allyship and assistance to people who are transgender or gender-nonconforming. We recognize that harassment in bathrooms and other gendered spaces is a problem not just for transgender individuals, but also for a variety people whose presentation of their gender may not fit the narrow archetypes of binary gender. #IllGoWithYou is for anyone who needs us. #IllGoWithYou is also not just for bathrooms. 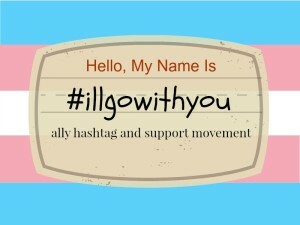 Our hope is that an #IllGoWithYou ally is also someone that can be asked to “go with” into a variety of situations where someone might experience gender-related harassment or simply need an advocate, such as doctor’s offices. That particular role is probably one where a friend-advocate is most appropriate, but knowing that your friend has already said #IllGoWithYou might make it easier to ask! The #IllGoWithYou button is intended to advertise allyship in public places and therefore “bathroom buddy” is the most likely request!